Here it is. 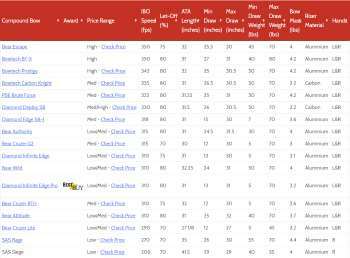 A useful comparison table listing all the compound bows we're reviewed and some we haven't. Clicking the little arrows in the column headers below will allow you to sort this table by any specification you want. Fastest on top? Highest let-off? Lightest? Just click the arrow in the relevant column and you can sort by whichever you choose. If you're on a mobile device or tablet this table will seem very big, but it is scrollable, just swipe across to see the columns hidden to the right. In case you don't know, or need a reminder here's a very quick explanation of what the contents of each column mean. If we like a particular bow enough we'll give it a little award. We generally reserve these for those bows we think are the best for a particular use or are just stand-out in general. Prices fluctuate. That's one of the reasons why we don't usually list them. You can be pretty confident however in price ranges. Med - Mid market prices and mid market kit, good enough for most of us! There's a standard measurement that manufacturers use called IBO speed. This tells you how fast one bow is compared to another. IBO Speed is the speed of a 350- grain arrow released from a 70-pound bow with a 30-inch draw length through a certified chronograph, measured in feet per second (fps). It doesn't tell you how fast your bow will actually shoot an arrow. That's determined by lots of factors including the length / weight / tip and fletching of the particular arrow you use. So use this figure as a power comparison with other bows, don't expect to automatically achieve those advertised speeds. If you don't know what let-off is, take a look back at our guide, this column lists the percentage let-off you can expect from this bow as a percentage. The length in inches from the top cam to the bottom cam of a particular bow. Know your draw length? Compounds are usually adjustable and can be adjusted to suit a range of draw lengths. These columns list the minimum and maximum lengths in inches that a bow supports. Draw weights on compounds bows can also be adjusted to suit a range of users and uses. These columns list the minimum and maximum draw weights in pounds that a bow is available in or can support. Bow Mass - How Heavy is it? Carbon is lighter than aluminium. A nicer carry for a long hike. Some aluminium bows are also pretty light nowadays. The weight of something you're going to hold outstretched for any length of time matters. If you know which handedness of bow you need you then need to know if the bow you're looking at comes in a left handed and a right handed variant because some are only made and sold for right handers. If you need a little more detail, we've gone into some depth with all the different editions of the Bear Cruzer vs the Diamond Infinite Edge with a full in-depth on these two bows. Hopefully you've found this useful. Sometimes tracking down all this information is time consuming so we did it for you! If there's anything you'd like us to add or you think would be useful, please let us know in the comments section!